Creating a talent pool is the easiest way to build enough quality candidates so that you can source within your own pool before having to look any further. These “warm” candidates will be more likely to respond since they are familiar with your company. 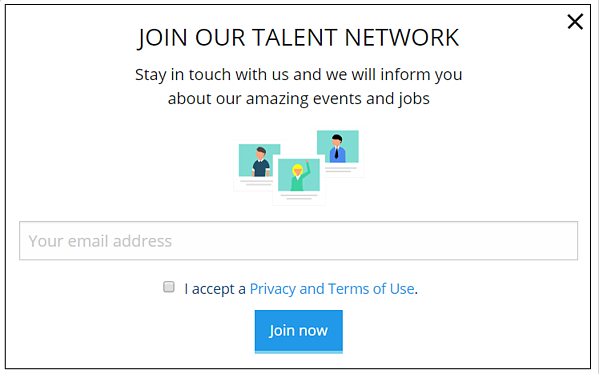 By integrating a talent pool into your careers site, you enable candidates to stay in contact even when there are no relevant positions available. This also helps the candidates to stay connected with your brand and remain open to future positions. Keeping in contact with potential candidates is a great way to keep them interested in your company. If you’re sending them regular emails or monthly newsletters with updates on what is going on at your company, they are more likely to remain aware of what open positions you have. Get creative with opportunities to stay in touch, like sending out a company Christmas e-card or letting candidates know which events and fairs you will be at in the next few months. This is also a great place to share employer branding stories, as mentioned below. When you think of sourcing today, you mostly think about online sourcing. But there is something to be said for the lost art of face-to-face interactions. Hosting and attending events can help you to not only get to know new candidates and but also to stay in touch with candidates in your talent pool. 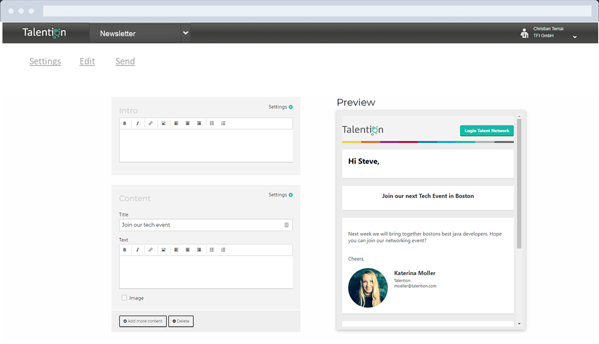 Candidates can easily sign-up and join your talent pool via a tablet or laptop at an event. This is the perfect opportunity to then send them a welcoming email containing the relevant information about your current open positions and your brand. Plus, now that you've met them in person, the eventual interview process will be much easier. Building up a positive employer brand is a crucial part of a successful sourcing strategy. You should have a brand that candidates are excited about and want to be a part of. It also helps to have a familiar brand so that when you are sourcing you don't have to start from zero with each candidate. Employer branding stories can be shared in a variety of ways. You can do this via your newsletter, at events, through social media, and on your career site. The key is to make sure that these stories are consistent with your brand and that they leave candidates with a positive feeling about your company. With the constant growth of the internet, there seem to be an infinite number of new sourcing channels. It would be a shame to miss out on them because you've been using the same channels for the past five years. We've put together a list of 22 sourcing channels to help you get some inspiration and find new ways to reach relevant candidates.